If you think Manila is crazy, think again. 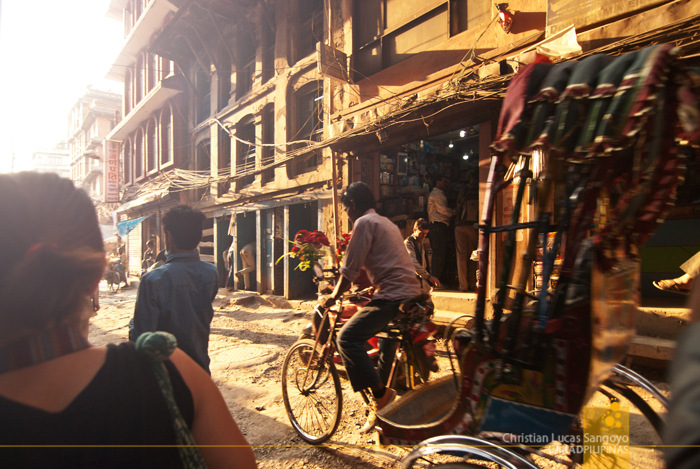 My jaw dropped to the dusty roads of Kathmandu the first time I went out of Hotel Ganesh Himal, our lodging of choice at Nepal’s capital city. The place is crazier than a chicken coop during feeding time. The streets, which are more like alleys, are dusty and narrow as heck, but the traffic is as hectic as can possibly be. Motorcycles, trucks, rickshaws, street hawkers, and pedestrians all battle for space with horns and honks like there’s no tomorrow. But once you get past that, Kathmandu is a really beautiful place. It’s full of interesting people, curious wares, grand sweeping temples, and archaic architecture. The cliché that goes that there is beauty in chaos cannot be more true than in Kathmandu. notice that even though it looks chaos, the place that looks like Divisoria or Baclaran still has tourists? ^_^ guess that's because there's no snatchers in the place... not yet.